"What happens when magic and science are synonyms?" Creatures of nightmare wander the void between worlds, but that has not stopped the spirit of exploration. The power of magic allows lone wanderers and advanced societies to traverse Afflatus, the very framework of reality, and find other civilizations waiting for them in the darkness. Experience a multiverse where androids and werewolves make shaky alliances, where magic knights armed with high tech gadgetry face off against evil warlocks, and where rogue deities have to lie low…or risk facing off with the elite mages of the Crossworld Security Force. Deucalion Chronicles has not been tagged yet. 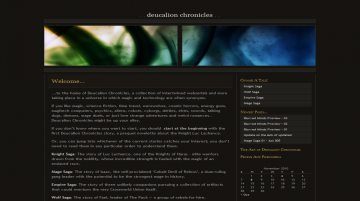 Help others find Deucalion Chronicles by tagging it! Deucalion Chronicles has not been reviewed yet. Deucalion Chronicles has not been recommended yet.